My resolution to learn and use a new ukulele song in my story times each month is off to a great start! I opted to begin 2014 with the song "Sleeping Bunnies," which I've heard recommended by many a librarian I admire. I've found it's an excellent song for most any story time group, both in the library and at outreach, as it incorporates fine motor play, soft and energetic music, and a great level of participation. Start with sleeping bunnies--either the kids themselves are the bunnies, lying down and asleep, or the kids hold up two fingers for a snoozing bunny. Then, as the song progresses, those bunnies get up and hop, hop, hop! Every time I've shared this song, it has resulted in tons of smiles as well as hopping children and hands. 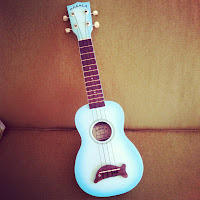 A wonderful addition to my ukulele repertoire! sleeping bunnies from Mary K on Vimeo. 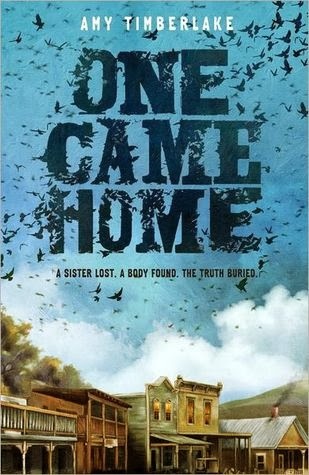 Now that the reading portion of my stint on the 2014 Newbery Committee has concluded, I'm back to being able to talk about my reading life. I'm very excited to be a social reader once again! That means I'll also be reviewing books on the blog again, and in the spirit of starting things off right, I've revised my review policy. I'm particularly looking forward to highlighting titles with connections to the STEAM areas--both fiction and nonfiction--in the coming months. As I continue to develop engaging STEAM programming at my library, I want to stay abreast of the best new titles that will enrich my programs, book displays, and conversations with kids. So keep your eyes out for STEAM review roundups throughout the year! What are your favorite recent titles that connect somehow to science, technology, engineering, the arts, and math? Holy Bagumba! 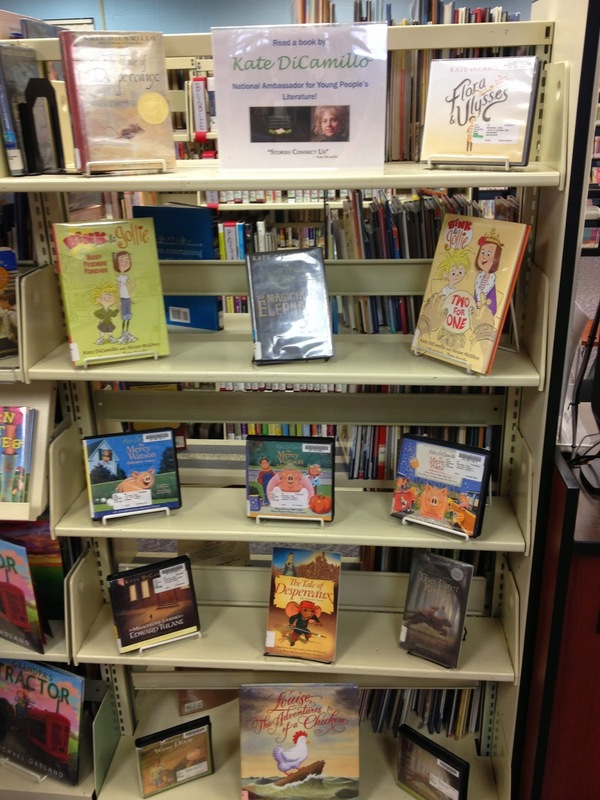 The 2014 Newbery Books! 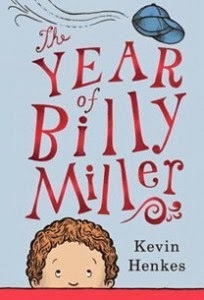 It gives me great joy to share the titles recognized as the 2014 Newbery Award and Honor books. I am incredibly proud of the work my committee did in dedicating a year to reading, rereading, discussing, and selecting these distinguished titles. I also want to give a big, public "thank you" to every one of my colleagues, family members, and friends for your unflagging support throughout the past year. I cannot wait to openly discuss books with you again this year! See the announcement webcast and all of the Youth Media Award winners here. Mark your calendars and pull out all your best passive programming ideas: February 1 marks the third annual Take Your Child to the Library Day! Take Your Child to the Library Day is a day to welcome all families in your community into the library and to really showcase the variety of programs, activities, and services that you can provide them. It's a great day to get a library card; to explore the stacks; and to meet the librarian. Anything to engage with all the library has to offer to children and families! The Take Your Child to the Library Day website has tons of ideas for ways YOUR library can celebrate and advocate, including info on a great giveaway through Bookboard. 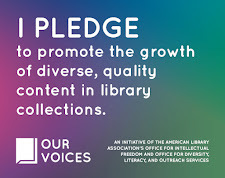 It's also got a comprehensive list of state representatives for the initiative as well as a list of the libraries all over the world who will be celebrating come February 1. Join the ranks and invite families to all that's great at your library! 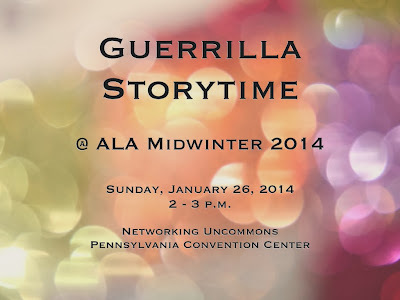 Don't forget Guerrilla Storytime at #alamw14 this Sunday! Attention all folks headed to ALA Midwinter this weekend! 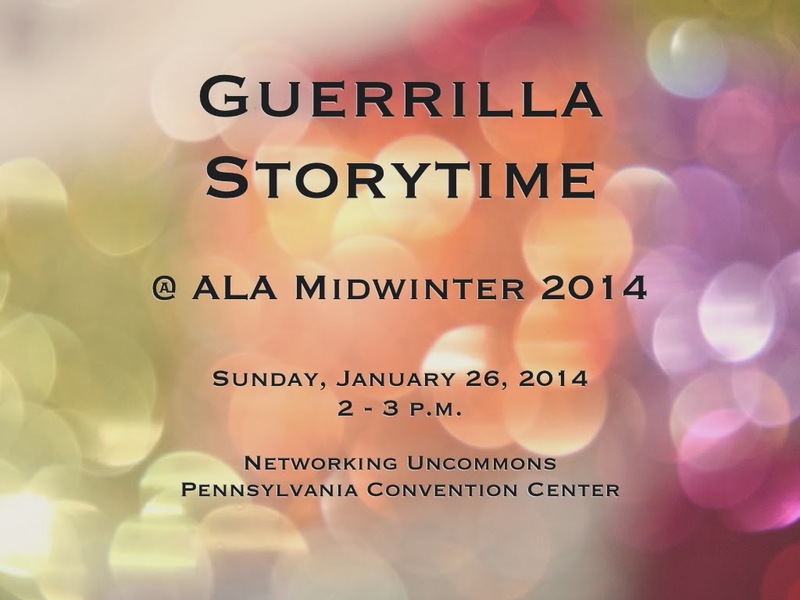 Make some room in your schedule on Sunday, January 26, 2-3 p.m., and head to the Uncommons for Guerrilla Storytime! It's advocacy. It's idea-sharing. It's grassroots training. And it's FUN! I'll be there with bells on. Or, at least, with an egg shaker and a ukulele. I hope to see you there and to hear all your great storytime tips! I've been offering preschool science programs for a while now, and during each program, I speak to caregivers about STEAM and how it ties in with early literacy. STEAM experiences allow children to develop understanding about how the world works. At the most basic level, these sorts of experiences introduce children to new vocabulary, content knowledge, and narrative skills that are an integral part of early literacy. The more a child experiences, the more a child knows; and the more a child knows, the more a child will be able to recognize and process when it comes to reading. STEAM is important. That's why I created a guide to STEAM for these families with young children. The guide resembles a handout on the five early literacy practices that accompanies my library's early literacy calendars, so it's a format with which my library families are familiar. 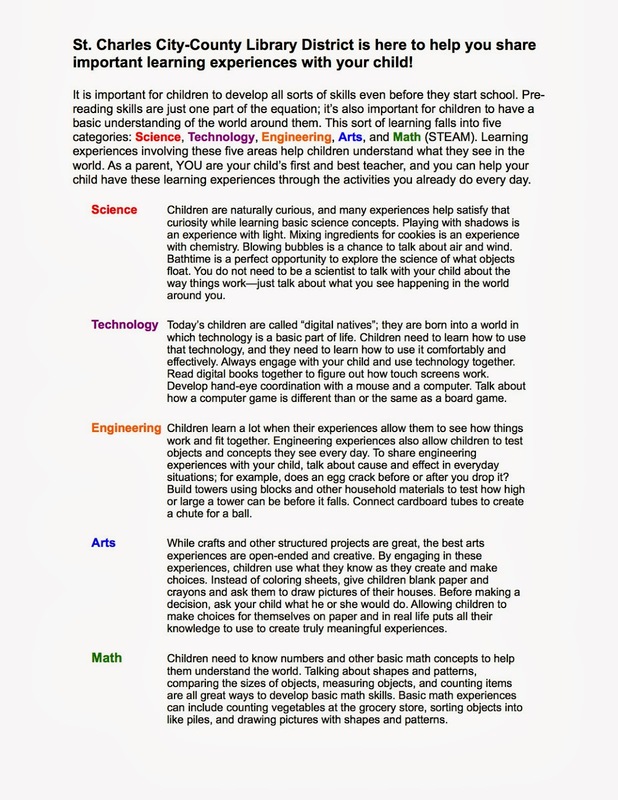 The guide explains what STEAM is, notes how it's important, and gives fun, simple activity ideas that families can do together to promote STEAM experiences and learning. I've found that parents really enjoy having a handout that gives them a running start when it comes to literacy-positive activities with their kids. These sorts of guides plant the seed for parents, and they empower parents to find the early literacy potential in every day. If I can accomplish that in my library, I consider my work successful. Well, I've done it. I've made my first ever from-scratch felt story, which means I am participating in Flannel Friday for the first time this week! My first endeavor into creating a felt story is a traditional folk story: The Elves and the Shoemaker. 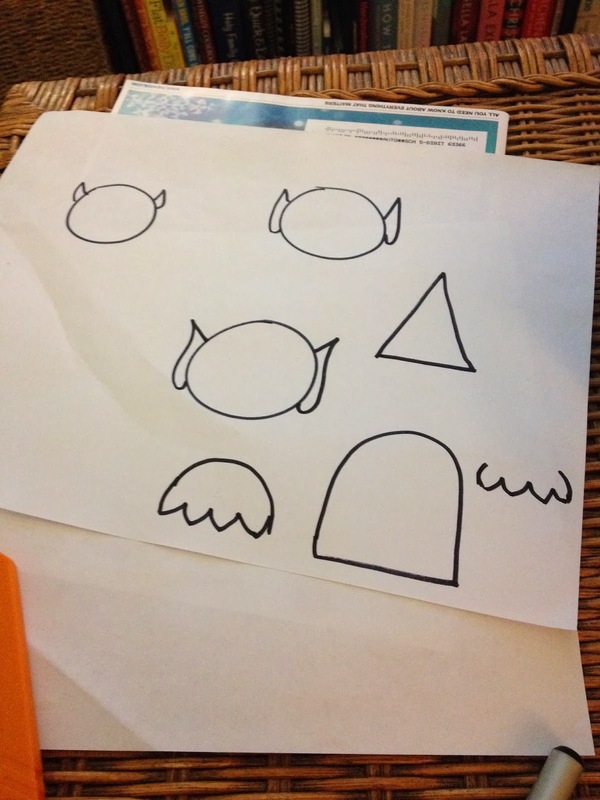 After reading and rereading the story and thinking about how I would tell it out loud to a group of preschoolers, I started making some drawings of shapes that I could use as felt patterns. After quite a bit of experimentation, I assembled two elves with removable outfits (as per the story); one shoemaker (who looks something like a Jedi master); and four sets of boots. My pieces were created with hand-drawn patterns, and they are made of felt with some tacky glue to hold bits together. I used black permanent marker to add fine details. Check out this week's full Flannel Friday round-up on Kathryn's blog Fun with Friends at Storytime. I'm on the ALSC Blog today sharing details of my recent Balloon Science program for school-age kids. For a full run-down of our variety of activities to explore the history and science of air balloons, head over to the ALSC Blog! Today, Marge Loch-Wouters and I are presenting on the topic of unprogramming as part of the two-day Wild Wisconsin Winter Web Conference. In conjunction with that webinar, I want to prompt you, dear reader, to think about unprogramming and to point you toward some resources to help you make it work for you at your library. some aspect of kids' and teens' interests that can connect back to the library? That's the key question for the key part of unprogramming: the library connection. The answer to this question can be incredibly varied--which is great, because that means your unprogramming options are pretty near infinite. You can aim to connect kids to award-winning books. You can aim to connect teens with your graphic novel collections. You can connect kids to their fascination of disasters and draw resources from throughout the collection. Possibilities for a starting point to unprogram are endless, and your programs are guaranteed to fit library goals when you start with this question. Marge is best at conveying the simplicity that is unprogramming, and so I will defer to her wording here. Marge and I have also been curating a Pinterest board rife with unprogramming ideas, resources, and program plans. Check it out and get unprogramming! We want to hear about them! Share your successes by using #unprogramming on Twitter. The complete slides for Marge and my presentation are below, and the archived webinar is accessible here. Enjoy, and sound off with any questions or comments! Ever since Marge at Tiny Tips for Library Fun blogged about her library's after-hours reading camp-in--twice! she's blogged about it twice, that's how great it is!--I've wanted to offer a similar program. This past Friday, I gathered my supplies, arranged for a coworker to stay after hours with me, and finally offered my own take on the program. Here's how we did it. My library closes at 6 p.m. on Friday nights, and I wanted our program families to be in the program room while the rest of the library was getting cleared out for the night. Thus I started the program a half hour before the doors would be locked. As families arrived in the program room--sheets, pillows, and blankets in tow as recommended by the program description--I passed out cups of walking s'mores. I've used this treat before, and it was successful once again. (Recipe: Mix together a box of Golden Grahams, a bag of mini marshmallows, and a bag or two of chocolate chips. Stir.) As the families munched on their treat, they found spots in the program room for the introductory activities of our evening. I shared two stories that worked very well to bridge the large age range of our attending children: Jon Klassen's I Want My Hat Back and This Is Not My Hat. Admittedly, these are two of my favorite books to read aloud--I like to think I add a certain over-exaggerated drama that really makes the story funny for all ages. The stories did not disappoint in this program, as the kids' gasps and laughter made clear. With ten minutes to go before closing, I handed out flashlights to the kids (leftover prizes from summer reading) and explained the rules. Additional building materials were available at the back of the program room: disposable tablecloths, fabric remnants, and floor cushions were ready for the taking. I explained that books could not be taken off the shelves for building forts--but they could be taken off the shelves for reading. I also reiterated a perennial library rule: use walking feet at all times. 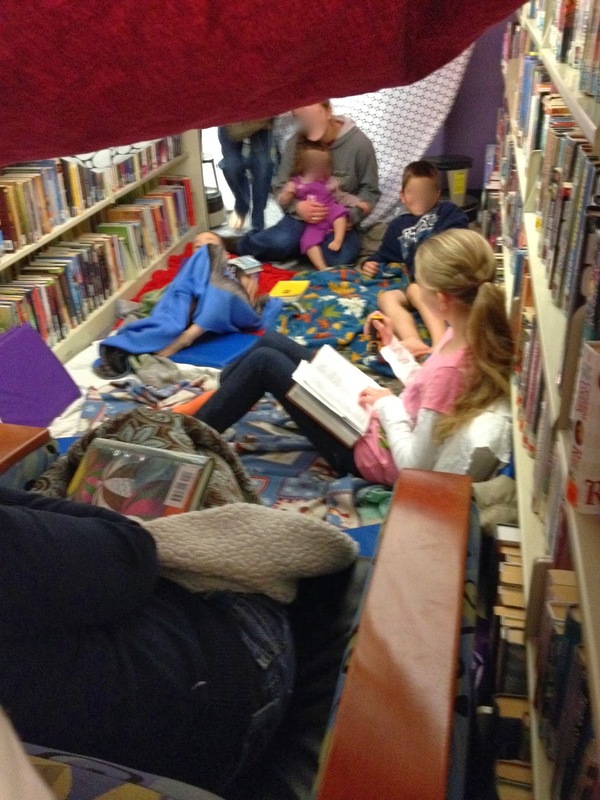 Once the customers and other staff were out the door, the families took over the library and carved out spaces for their forts. I would estimate, from my wanderings around the library, that most forts took about 10 minutes to construct. That left plenty of time for in-fort reading, and I was beyond thrilled to see the families engaging in reading together. In some forts, siblings took turns each reading a page or two. In others, mom and daughter browsed through a princess book together and talked about the pictures. This was reading gold, people. Library win 100%. I used the library's PA system to announce that it was time to start cleaning up forts. After supplies had been put away, everyone was to report to the information desk for the final activity announcement. 6:50 p.m. - Lights Out Hide and Seek! Hoots of excitement accompanied my announcement that we would wrap up the program with lights out hide and seek. I gave each family a single glow stick bracelet, and I explained that the person with the bracelet would be the hider. It would then be the job of the rest of the family to seek their hider. Once found, the hider would surrender his or her bracelet to the successful seeker, whose turn it became to hide. This strategy of creating teams, so to speak, worked really well. Sure, there were plenty of glow bracelets seen throughout the various library hiding spots, but seekers couldn't be sure until they got close whether they had found their hider. I turned off the overhead lights that illuminate the library stacks for our game, which left safety lights as well as illuminated areas at the front of the library. No one fell or stumbled, so the arrangement seemed to work well for our size group. Everyone was having such fun at lights out hide and seek that I let them have an extra five minutes before bringing the program to a close. Lights came back on, and I thanked everyone for coming as they gathered their fort supplies. I let all of the families out of the library at the same time so that no one would be trying to avoid cars in the parking lot--instead, everyone got to their cars safely at the same time. This unprogram was incredibly low-intensity for staff and attendees: low planning and minimal cleanup, with very high literacy connection and enjoyment. I highly recommend modifying it so it can work for your library! 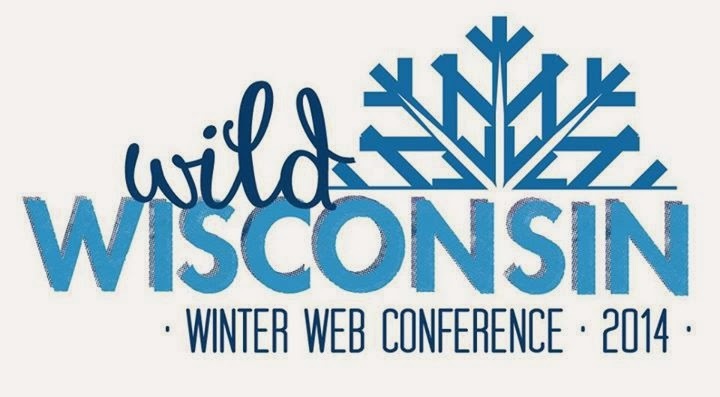 Next Wednesday, January 15, Marge Loch-Wouters and I will be presenting a session in the two-day Wild Wisconsin Winter Web Conference. This online conference boasts sessions on great topics from outstanding librarians like Sarah Houghton (the Librarian in Black), David Lankes, and Justin Hoenke, to name just a few. Marge and I will be presenting a session titled Unprogramming: Recipes for Successful Programming with School-Age Children & Teens. Our session will touch on what it means to unprogram and how unprogramming can benefit you and your library. We'll also include oodles of examples of unprograms that work, with a Pinterest page of resources to go with. This two-day, free, virtual conference will also be live tweeted at #wwwc14. For more information on the conference and its sessions and speakers, check out the event's Facebook page. I cannot wait for the ideas to start spreading next week. This past summer, a collaboration between my library and the county parks department resulted in some rather fetching natural-wood signs being permanently placed around a local park trail. While the impetus for those signs came down with the end of summer, both the library and parks department expressed an eagerness to continue our partnership through the winter instead of just waiting for next summer. The result is using several of these lovely signposts to share information that may be useful or interesting to our community members. The signs I created on behalf of the library feature what I hope will be some bits of inspiration for folks enjoying a winter walk. 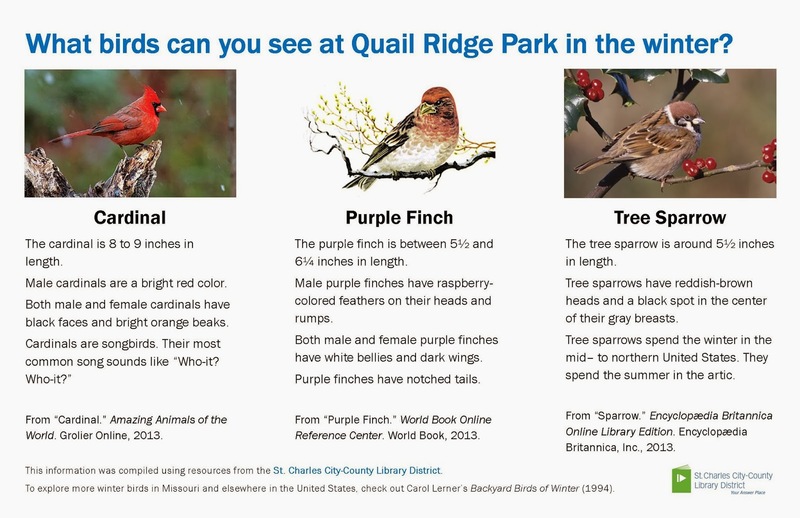 Using our library databases, I put together two different signs: one inviting hikers to look for three different birds native to Missouri this time of year; and one exploring the science and poetic beauty of snowflakes. The recent snowstorms prevented me from getting pictures of these signs in place out on the trail, but hopefully these images will suffice. 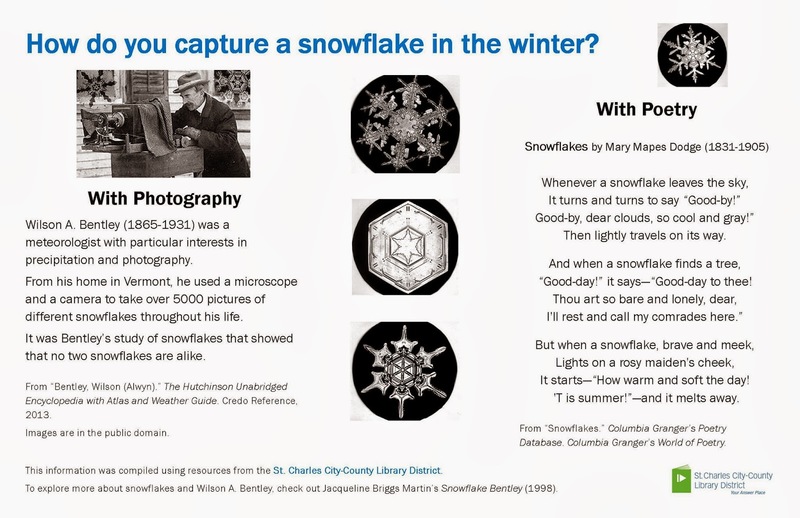 I am thrilled that we're using library information sources to create a sort of mini-exhibit, full of images, information, and tips for using the library for further exploration of these topics. Do you have any winter outreach to your community? What a wonderfully silly story. When Dinah the dinosaur hatches from her egg, she tries out all sorts of actions, including kisses. Yet a dinosaur has a hard time achieving a gentle kiss, and Dinah accidentally chomps, stomps, and whomps several unfortunate animal friends in her efforts to show them affection. Luckily, another dinosaur with Dinah's exact skill set is hatched, and the two hit it off. Literally. We enjoyed plenty of stomping around to this song, including holding our arms close to our sides to give ourselves tiny t-rex arms. All of the kiddos had a ball trying to "stop and eat our food," as the lyrics direct, with those tiny arms. The song ends with plenty of roaring, so of course it is a hit. I handed out egg shakers to everyone so we could all get boogying to the Shaker Hop. The song starts off like the Hokey Pokey, with shakers moving in and out, but also offers free dance breaks throughout the song. We spent our dance breaks shaking like we were animals in the ocean and like astronauts in space. Lots of imagination and vocabulary here! Props to add to the fun! Puppet/felt Story: "I Know an Old Woman Who Swallowed a Fly"
A colleague who used to be an elementary teacher gifted to me her puppet set for this story, and I made some velcro cards with the story's animals on them to provide further visual interest. While I started telling this classic cumulative tale on my own, the children soon picked up on the format and cheerily joined in. And, to demonstrate that children think statements like "Perhaps she'll die!" are funny rather than macabre, they had plenty of fun shouting that recurring line. I will share full details of this ukulele tune, including my chord sheet so you can play it yourself, later this month. It was a complete hit, and I am indebted to Jbrary and Miss Mary Liberry for mentioning it a few weeks ago on Twitter. This rhyming text explores several different types of bears, some of which are familiar to young readers and a few that are not. My kids enjoyed identifying the distinguishing features of the different bears in our reading of the story, and quite a few bear roars could be heard throughout the telling. Song: "I'm a Little Teapot"
The song cube landed with the teapot illustration pointed upward, so we sang this song. I was informed by a young girl that we needed to sing it a second time, "and do the other side." Okay then. This short, silly rhyme was a great way to wrap up our story time on a zany note. Lyrics and hand motions here. While our varied play stations included two types of blocks, magnetic writing boards, shape sorters, and our wooden garage/car set, the hit of the morning was the puzzle table. A group 5- and 6-year-olds worked together to solve a large 24-piece alphabet puzzle, at which point they decided (without ANY prompting from me!) that singing the alphabet song would just be the icing on the cake. Which they did, and it was. Then they asked me to get a harder puzzle, and they successfully assembled a significantly more difficult 64-piece picture puzzle with a bit of help from me. 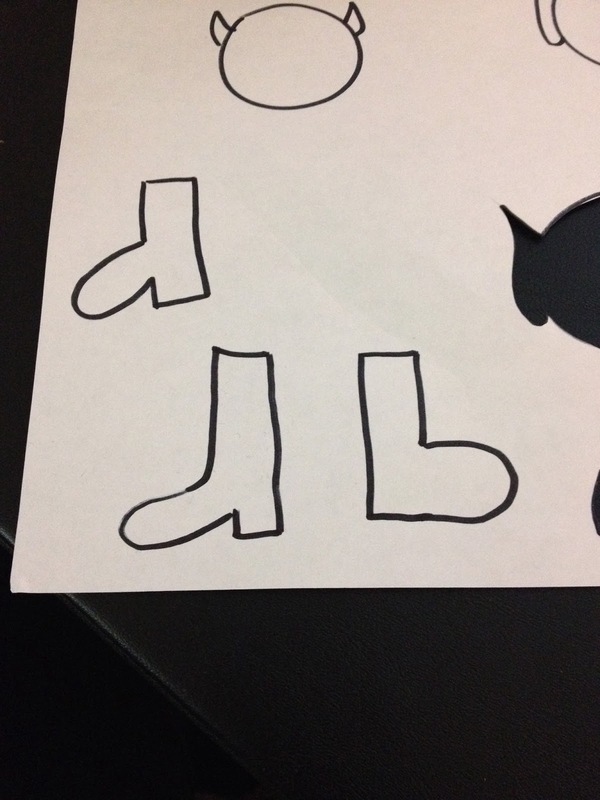 The visual literacy and problem solving skills that went into that play time were substantial. Kate DiCamillo named National Ambassador for Young People's Literature! I was very excited to check my Twitter feed this morning, as I was highly anticipating the announcement of the new National Ambassador for Young People's Literature. I'm sure you can imagine my utter delight upon reading that Kate DiCamillo has been named to the post! I was so delighted, in fact, that I spent the first 20 minutes of my shift both putting together a Kate DiCamillo display in my library (half of her books are already checked out!) and loudly sharing the news with my colleagues. All things considered, I have not been a librarian for a particularly long time. 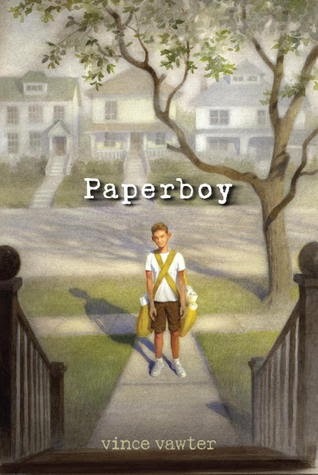 One thing that has been consistent throughout my stint in librarianship, however, has been my propensity to introduce readers of every ilk to Kate DiCamillo's books. 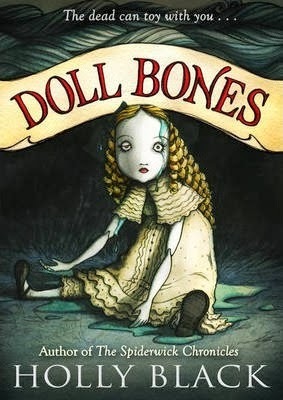 Her oeuvre truly spans that amorphous zone embodied by "young people's literature." 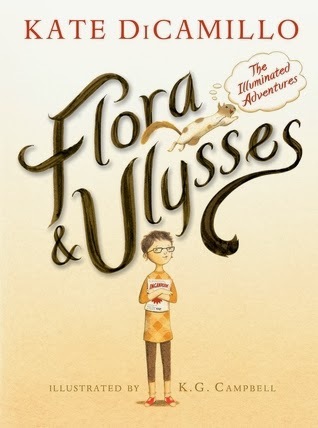 She has books for emerging readers, and books that challenge older readers; books beloved by both boys and girls; books that make you laugh until milk comes out of your nose, and books that make you feel all of the feelings. My kids always come back to rave about Kate DiCamillo books after I put one in their hands. The Library of Congress and Children's Book Council name a National Ambassador for Young People’s Literature every other year. The ambassador's task becomes raising "national awareness of the importance of young people’s literature as it relates to lifelong literacy, education and the development and betterment of the lives of young people." I have no doubts that DiCamillo is up to the task. 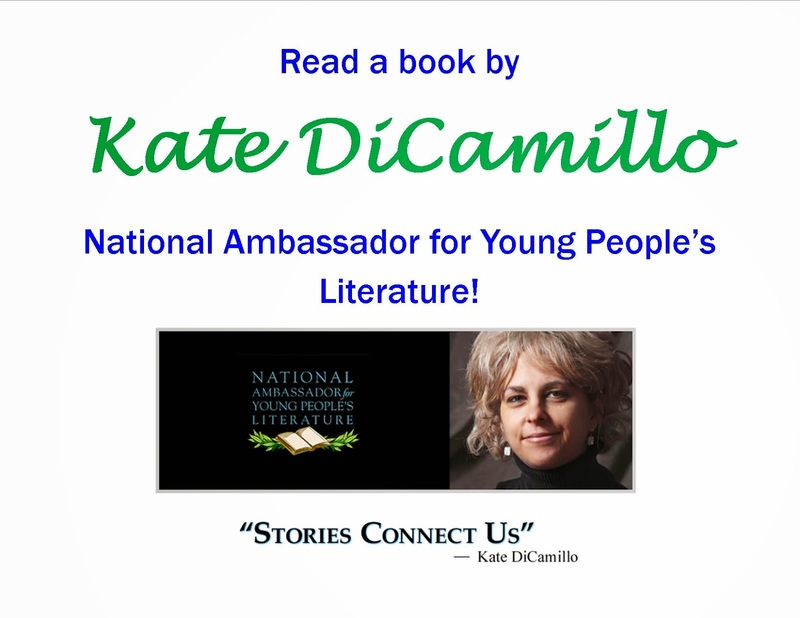 See the National Ambassador for Young People's Literature website for full details on selection criteria, DiCamillo's credentials, and the calendar for DiCamillo's tenure as Ambassador. I've been giving some thought to my goals for library services in this new year. Last year was all about STEAM in so many ways, and I'll continue to spend considerable time on my own STEAM initiatives as well as promoting STEAM at conferences in 2014. What I decided, though, as I reflected on the fact that 2013 birthed the Storytime Underground movement, is that my story time skills could use some expansion. I gave that general goal some thought, keeping in mind that the heavy majority of the story times I provide happen at large outreach locations and thus have few story time "extras" (i.e., parachute, shakers, bells). 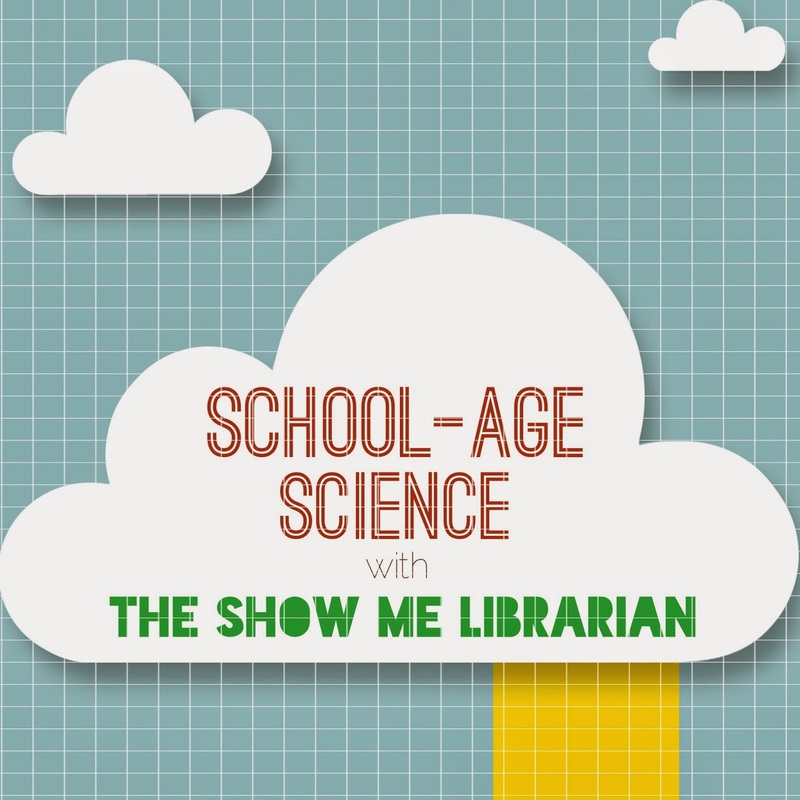 What I came up with were two monthly tasks for myself to both spruce up my story times and push my librarian skills, as well as a goal to better use the plethora of resources out there in libraryland. 1) Share a new (to me and my kiddos) ukulele song every month. That'll be a total of 12 new songs added to my repertoire by the end of the year. 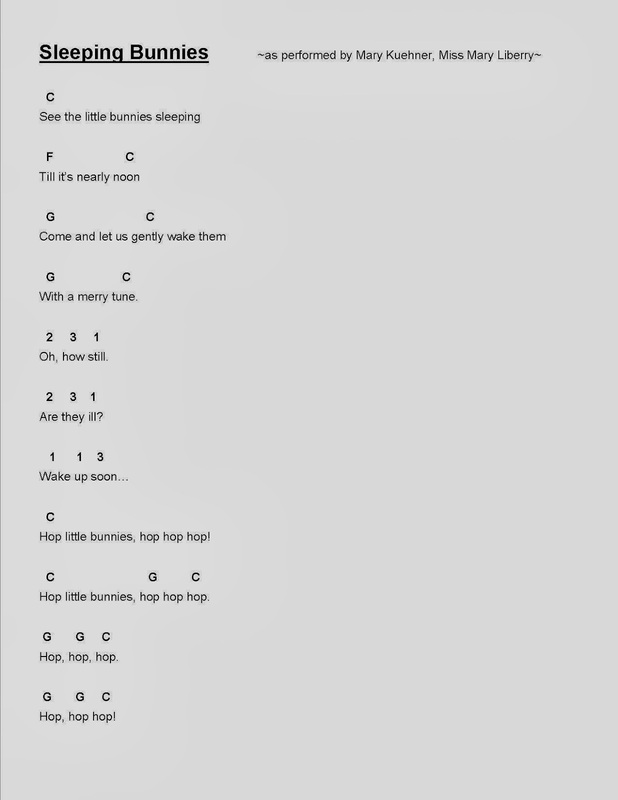 Since I'm the sort of person who needs a chord sheet in front of me in case my mind fizzles out come story time, I'll be putting together simple lyrics-and-chords sheets and sharing them here on the blog (copyright permitting, of course). 2) Create and use a new felt story every month. My personal felt story collection currently consists of a store-bought Little Red Hen. It's an okay, generic set. With plenty of encouragement and tutelage from the fantastic folks at Flannel Friday, however, I am embarking on a journey to create 12 felt story sets that work with the way I tell stories. 3) Pay better attention to the resources being shared by outstanding story time librarians, and go beyond just bookmarking them "for later." I'll keep a close eye on Anne's Instant Professional Development series, for example. And I'm ALWAYS grateful to see the storytime badassery that Cory links to at Storytime Underground. With some thought and hard work, I'm going to make my 2014 story times even better than their 2013 cousins. If you've got tips to help me achieve these goals, I'd love to hear them in the comments or on Twitter. And love and support to you as you aim still higher for your own library services this year!